Regis Philbin is a New York native and Notre Dame graduate born to an Irish-American father, Frank, who served as a Marine in the Pacific and a mother, Florence (née Boscia), who was of Arbëreshë heritage. Philbin, who holds the Guinness World Record for the most time spent in front of a television camera, was inducted into the National Association of Broadcasters Hall of Fames as well as the Academy of Television Arts & Sciences Hall of Fame in 2006. Philbin got his start in broadcasting in California in 1967. For a time, he was best known as Joey Bishop’s sidekick on the Joey Bishop show, but Regis quickly made a name for himself. A Bronx native, he returned to New York in 1982 and began working on The Morning Show. The show took off, Kathy Lee Giffords became the co-host in 1985, and it was nationally syndicated in 1988. Giffords left in 2000 and in 2001 was replaced by Kelly Ripa, who is currently Philbin’s co-host. 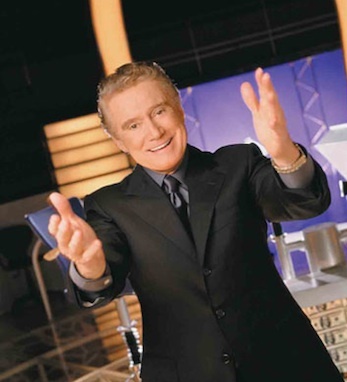 In addition to his years on Live with Regis and Kelly, Philbin was the host of the game show Who Wants to Be a Millionaire, on which he made the phrase “Is that your final answer?” iconic. Philbin announced in January that he plans to retire from Live with Regis and Kelly at the end of the 2010-11 season, after close to thirty years in that time slot on morning television. Irish America has twice been featured on Regis’s show, and we would like to say a special thank you for all the support through the years. We will miss you, Regis.